CALVIN SUMMERS and Minister Jim Goforth have come all the way from Texas in the United States to help local churches reach out to communities, promote unity and spread the message of Jesus’ love in a fresh way during the London Olympics. 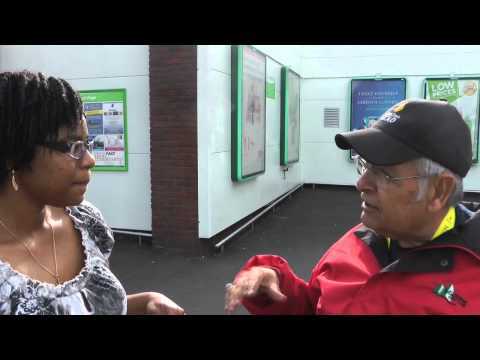 Just outside Asda in the Isle of Dogs in east London, they talk to The Voice’s Trudy Simpson about their organisation More than Gold, their activities so far and why being here for the Games is so important. Just outside Asda in the Isle of Dogs in east London, they talk about their organisation More than Gold, their activities so far and why being here for the Games is so important. Calvin Summers and Minister Jim Goforth speaking to Voice News Editor Trudy Simpson.